Sikerrel zárult a 2010. március 17-18-án Finnországban, a Jyväskyläi Egyetemen megrendezett II. Nemzetközi Nietzsche Szimpózium. Az "Életrajz, történelem, poétika és filozófia a nietzschei narratívák után" tematikájú találkozó keretében 3 kontinens 16 kutatója tartott előadást. A konferencia anyagait egy kétnyelvű kötetben, a Jelenkor Kiadó gondozásában adtuk közre: Érzéki tapasztalat és kritikai gondolkodás. Szerk. Fenyvesi Kristóf és Orbán Jolán. Jelenkor Kiadó, Pécs, 2012. A szervezők köszönik a szimpózium fővédnökének, Dr. GARY SHAPIRO-nak (University of Richmond, USA), Rainer J. Hanshe-nek, a Nietzsche Circle (New York, USA) alapítójának és Vály Sándor (Helsinki) képzőművésznek, hogy lelkes érdeklődésükkel pártfogásukba vették az rendezvényt. Szimpóziumunk címe Gary Shapiro, amerikai filozófus 1989-ben megjelent művére utal (vö. Gary Shapiro: Nietzschean Narratives. Indiana University, 1989.). A nagy hatású monográfia egy olyan értelmezői perspektíva lehetőségét mérlegeli, amely a nyugati teoretikus hagyományban mindmáig ellentétesként ható, ugyanakkor a nietzschei életműben egyaránt jelenlévő poétikai és filozófiai pozíciók között a kritikai narratológia szempontrendszerének bevezetésével keres átjárási lehetőségeket. Shapiro könyvének tanúsága szerint a Nietzsche munkásságában kimutatható narratív mintázatokat követve a legkülönfélébb kutatási területek (a klasszika-filológia, a történettudomány, az etika, az esztétika, a nyelvkritika, az episztemológia, a pszichológia, a genealógia, a kulturális kritika, a filozófiai hermeneutika, az irodalomelmélet, a különböző testelméletek, mediális és kognitív megközelítések, stb.) 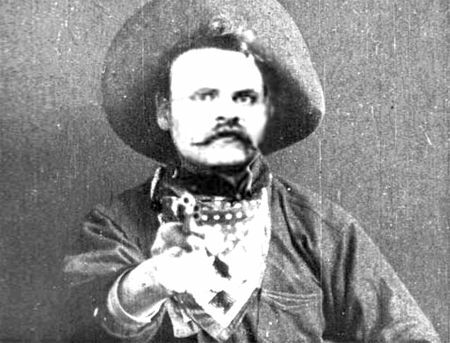 közvetlen összefüggésben ábrázolhatók Friedrich Nietzsche művészi alkotásaival (legyen az költemény, zenemű vagy akár egy általa beállított műtermi fotográfia), szövegalkotási gyakorlatának, gondolkodói attitűdjének irodalmi tendenciáival vagy az emberélet művészi megformálására irányuló fejtegetéseivel. A Nietzsche által működtetett, egymással versengő narratívákat felvonultató, sokszintű diskurzus tanulmányozása a Shapiro-könyv megjelenése óta eltelt húsz évben jelentős érdeklődésre tart számot, széleskörű narratológiai irodalma van. Szimpóziumunk lehetőséget kíván adni különféle területeken dolgozó résztvevőinek arra, hogy az elmúlt évtizedek elbeszéléselméleti fejleményeire is figyelmezve mutassák be a nietzschei filozófia egyéni tudományos irányultságuknak leginkább megfelelő hozadékait: mindazokat a problémákat, kérdéseket amelyek termékenyeknek bizonyultak számukra – szabadon tallózva a „nietzschei narratívák” között. 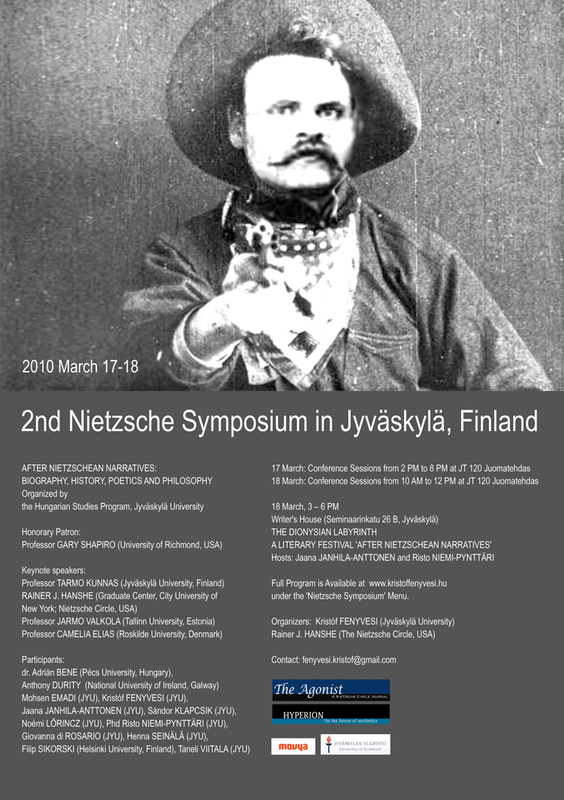 "Greetings to the Nietzsche Symposium in Jyväskylä! Many thanks to Kristóf Fenyvesi and to all the speakers and participants for taking Nietzschean Narratives as a provocation for thinking and discussion, and for arranging a session on my talk on “Nietzsche’s Crisis.” Naturally I hope to read your texts and to learn what thoughts emerge on March 17-18. I was honored and surprised to learn of the symposium, and I would have tried to travel to Finland to join the Hyperboreans, if not for previous commitments. I had arranged to be in Brazil until March 12, to participate in a symposium at Museu Vale in Vitoria (where I will give the talk on “Nietzsche’s Crisis,”) and I must be at the University of Richmond March 15-21, to prepare for and help to install a work of environmental art by David Wood (Philosophy, Vanderbilt University), a project which is in keeping, I think, with Nietzsche’s injunction to be loyal to the earth. Although the Marxist aesthetician Georg Lukács and the National-Socialist interpreter of Nietzsche, Alfred Bäumler, saw Nietzsche as a forerunner of the Fascist or National-Socialist ideology, both of them almost understand that Nietzsche's thinking largely transcends all political categories and that he is not a real "Fascist". Nietzsche was not a democratic thinker, but it was quite natural at his time to be antidemocratic, because the becoming parliamentarian democracy was not yet considered as "the less bad of all governmental systems". Nietzsche's words and expressions sometimes give an image of a thinker who cherished a cult of violence and war mystic. But before one presumes that, he should measure and interpret the metaphorical dimension and the spirit of parody in the Nietzschean language and style. Nietzsche is not really a social Darwinist. It is well-known that Nietzsche was not a racist. He sometimes sees the Hebrews of the Old Testament critically, but he very much admires the European Jews of the nineteenth century. He recommends the mixing of races. Nietzsche was also a radical critic of the awakening German nationalism. He is not primarily a biological thinker, because he is looking for new dimensions and possibilities of human being. His superman is a human, social and moral ideal, possible at every moment, not a biological entity. Many dimensions of Nietzschean thinking seem to express a deep contradiction with Fascism or National-Socialism. How can we understand in the light of this that many European writers and thinkers who were influenced by Nietzsche, were close if not to National-Socialism, to Italian Fascism: Gabriele d'Annunzio, F.T.Marinetti and the other futurists, Curzio Malaparte, Giovanni Papini, Mussolini himself, Pierre Drieu La Rochelle, Louis Ferdinand Céline, Alphonse de Chateaubriant, Paul Morand, Ernst Jünger, Gottfried Benn, Hanns Johst, Martin Heidegger, Knut Hamsun, Bertel Gripenberg, Örnulf Tigerstedt etc. Beyond the official Fascist ideology (Hegelianism and Statalism) and National-Social ideology (antisemitic racism, German nationalism) there was after the first World War an anarchist-conservative time spirit very much influenced by Nietzsche, which was not only political. The criticism of European "decay", which everybody understood in its own way, a thirst for a tragic feeling of life and for the tragic image of heroic man, the return of the mythical antirationalism and anti-intellectualism, the cult of vitality beyond good and the evil were the Nietzschean elements that were not only in fascist thinking of the time, but everywhere. So these intellectuals looked for a vital and tragic alternative for the hegemonic traditions of Stalinist communism and the American way of "plutocratic" liberalism. They falsely identified it with Fascism and forgot and misunderstood the real and destructive side of fascist movements. Nietzsche was not a forerunner of Fascism, but he deepened in some respects the contact of some intellectuals with the spirit of time that coincided with Fascism. Aside from Nietzsche’s two strictly poetic works, the Idylls of Messina and the Dionysus Dithyrambs, his juvenilia and the poems that accompany many of his books illustrate that he wrote poetry from the age of nine till his collapse at 44. Considering his critique of the poet and poetry, which is perhaps even more stringent than Plato’s, how account for this sustained poetic activity? Is there, as most if not all critics believe, truly an irresolvable incongruity here? From his early work to his final writings, I contend that Nietzsche actually maintains a distinction between two poetic types, the “liar” and the “poet of the future,” and it is always as the second type that he writes when he poetizes. An elaboration of these types will elucidate Nietzsche’s Platonic polemic and clarify that, in fact, there is no incongruity. In line with this, I will examine the “closing melodies” or endings of the Gay Science and Beyond Good and Evil and the integral relationship between the final aphorisms of those books and their concluding poems. Consequently, this should destabilize the prevailing view that Nietzsche’s texts are a series of irregularly arranged fragments and reveal their grand architectural or symphonic structure. In Béla Tarr´s oeuvre, we should take into consideration not only the formal properties of a work of art but also such elements as the ideas contained in the work, emotional expressiveness, the fidelity to the represented external reality, the depth of insights, and an analysis of the moral and psychological problems. Tarr’s time is extended in long takes. The spaces have been modified so that all the deep-focuses are there. The action takes place on different levels of the composition. This makes it possible for Tarr to use his own stylized camera calligraphy. Tarr’s characters are wanderers, they follow their desires to encounter experiences that may deliver them from symbolic exile and bring them to reconciliation with the condition of their solitude through eternal return and circularity. In this paper I shall briefly examine the novel Prae (1934) by a Hungarian author, Miklós Szentkuthy, and I shall attempt to situate it in a Nietzschean context. Prae, the first modernist novel in Hungary, is a mixture of novelistic and essayistic passages. The author began to write Prae in 1928, but after some time he realised that he was incapable of creating a narrative, and that he enjoyed fine arts, architecture, and fashion much more than literature. Nevertheless, he continued writing and theorising about this very incapability. In effect, in the theoretical parts of Prae Szentkuthy created an original theory of literature. One of the main aspects of his theory was literary character, which – according to Szentkuthy – was supposed to be neither psychological, nor narrative, but a visual entity. Szentkuthy knew well the main trends in philosophy of his time, and Nietzsche (beside Bergson) was one of his favourite philosophers. It is my hypothesis that Nietzsche’s philosophy influenced some concepts which Szentkuthy used when theorising literary character. I shall attempt to show it with an example of a notion of surface, which is constantly present in Prae. Szentkuthy claims that instead of looking for psychological depth, one should attempt to look at the surface, i.e. the visual, the sensual side of literary characters. Thus, he poses challenge to contemporary theories, which treat literary character either as psychological entity, or functional element, and in consequence, they overlook the fact, that a character – apart of being read – is also seen. The tautology in the title refers to the double meaning of nausea in Nietzsche’s late thought: his antifoundationalism and perspectivism includes not only an epistemological and moral scepticism but at the same time he recommends that we create our own worldviews. The poisoned food of the given, the dogmatic meanings lead to an aversion as well as to being pregnant with new understandings. This doubleness can be seen more clearly in comparison with Sartre’s Nausea (supposedly inspired by Nietzsche, besides Heidegger), which stresses the absurdity of contingency and the efforts to give meanings to our existence simultaneously. It is almost a truism that the thematic and formal aspects of detective fiction, as well as the institutionalization of the genre recapitulate the (bourgeois) esthetic of rationalization. It is another well-known critical argument, however, that such forms of rationality are subverted in seminal texts of the traditional whodunit, such as the fiction of Edgar Allan Poe, Arthur Conan Doyle, and Agatha Christie. My paper intends to analyze such subversions, correlating it with Nietzsche’s criticism of rationality and science in his On the Genealogy of Morals, The Will to Power, and “On Truth and Lying in an Extra-Moral Sense.” These theoretical texts foreground the problematic nature of the neutral subject, orderly form, monosemy, and so on. Thus, as Paul de Man points out in his analysis on Nietzsche, basic dual oppositions, for example between inside and outside, cause and effect, object and subject enter into the game of endless reversals, creating controversial, oscillating, liminal arguments, situations and subjectivity. Doyle’s and Christie’s fiction is saturated by similar liminal places and characters: their detective is a controversial figure, equally idle and active, unique and stereotypical, a scientist and a pseudo-scientist, a member of the State and an antisocial rebel. Thus, my paper will demonstrate that Nietzsche’s philosophy forms the basis to find generic liminality between whodunits and science fiction, as well as thematic, spatial liminality in numerous texts of popular fiction. This paper aims at combining Professor Shapiro’s reading of Nietzschean narratives with some narratives explored recently by ergodic literature. Shapiro’s work will allow us to compare the pluralistic narrative styles of Nietzsche with hyper-textual writing practice. We will concentrate especially on Nietzsche’s Ecce Homo and Shelley Jackson’s Patchwork Girl, as examples on the one hand of “Nietzsche's own interpretation of his development, his works, and his significance” (Kaufmann 1967: 201) and on the other as a meta-textual work which explores the construction and self-construction of text and identity. By focusing on the contradiction involved in becoming and being and on what may be the ambiguity of becoming what one is we show how these new literary models, unknown to Nietzsche, allow for a deeper exploration of narrative. We explore the idea of body as metaphor and show how the uncanny and monstrous is manifested in a diversity of manners in this classic philosophical text and modern electronic text. The focus of Niemi-Pynttäri´s presentation is the changes of the concept of agonism between pre-modern public spaces and social web. He will study how the concept of agonism changes in Nietzsche, Arendt and Sloterdijk. Nietzsche uses Zarathustra as a metaphor for poet-philosopher that defines the concept of prophet in a relation between magic as a re-interpretation of events, miracle as an invention of reality, and reality as a narration of nature. Any contact between poetry, philosophy, and religion in Iran as the homeland of Zarathustra was dangerous after an Islam that belonged to the category of Judeo-Christian religions. The Quran speaks of poets in a Sutra called “poets” and the Sutra starts by questioning the difference between magic and miracle, telling the story of Moses and magicians, and ends with an important statement about poets, who are wicked and lost. The Quran and Plato declare a war against poetry and for about eight centuries after Islam, no poet called him/herself as a poet. Poetical interpretations of Islamic thoughts were dangerous as for Hallaj, an important figure of early Islamic thinking, who was burned in a fire, or Suhrawardi, a philosopher after Hallaj who was killed in the same way. The essay suggests a relational model of poetry and philosophy and tries to read and interpret Nietzsche’s Zarathustra in the context of oriental philosophy based on the relational model. There has been a vast interest in Nietzsche’s various styles and narratives many of them asserting that the key to understanding his philosophy lies explicitly within his style. The main emphasis has been on his literary and artistic approach to philosophy which has been given the largest significance. The other more critical line of interpretation has also stressed Nietzsche’s fragmentary and aphoristic style but conceives it as self-contradictory and incoherent. His philosophy has been seen as nonanalytical and unsystematic. From my point of view both of these lines of interpretation are misjudged although partly true. We ought to do a deeper than surface analysis of Nietzsche’s texts and ask why he gave style such an important role in his thought? My aim is to show that there is a well-grounded reason why Nietzsche used such a writing method which is primarily philosophical but also educational. On the surface level it might seem as if his writing is unsystematic, self-contradictory and incoherent but an in-depth reading reveals that Nietzsche’s style serves mainly the purpose of critique but also his positive philosophy. One can ask why the critiques are so mystical and esoterically presented. The reason is that Nietzsche does not want blind disciples. There is a strong pedagogical approach in Nietzsche’s philosophy. He strives to be a teacher who does not give straightforward answers although he directs his readers to a certain way and has a certain goal in his mind. But at the same time he leaves the goal indeterminate and to determine by his readers and the future overmen. Leaving the questions unanswered enables his readers to comprehend and make their own minds by themselves. This kind of self-realization is what Nietzsche called the overman for by stating to become who you are. In the heart of Nietzsche’s style there are didactics – Nietzsche as an educator. Pavel Kouba’s book, The Sense of Finitude (Smysl konečnosti, Praha, Edice Oikúmené, 2001) is one of the endeavourings the aim of which is to create a new Nietzsche interpretation. He rejects the postmodern conception of Nietzsche as philosopher of pluralism, based on Heidegger’s reading of Nietzsche. It would be illuminating to examine his argumentation in the context of his former book on Nietzsche (Nietzsche. Filosofická interpretace, Praha, Edice Oikúmené, 1995). One of the chief characteristics of the aphoristic style is the reduction of a set of ideas to an essential minimum. When the practitioner of the aphorism, a fragment, or a maxim, is successful, it takes, however, not only skills to produce elegant bottom-lines, but also a sense of how far such bottom-lines can be stretched. Readers of Nietzsche appreciate the philosopher's capacity to encapsulate complex ideas in a simple form, which is yet quite complex in itself. This being the case, I want to look precisely at Nietzsche's elasticity when it comes to articulating his well-known desire to ignite established ideas, and blow them to pieces with his own dynamite. Quite literally, can an elastic set things on fire, survive the fire? Can a truth be final even when it is elastic? What does it mean to write, for Nietzsche, when writing presents itself as a sin against silence, as a fire that burns the very abstract that is supposed to transcend even the very production of meaning? Thematically, I'm interested in looking at how Nietzsche formulates epistemologies of creative writing against the background of such stylistic devices which have the genre of the aphorism and the fragment as primary media for expression. The topic refers to Elisabeth Förster-Nietzsche’s method of making stories, biographies, and articles about her brother. It also contains the idea of writing as a practical skill that can be taught and learned like any other art, craftsmanship or professional expertise. How can a literary presentation complement scientific presentation? Could Elisabeth Förster-Nietzsche’s literary work and fiction complete Nietzsche’s philosophy and poetry? The method of philotechnique (Gr. skill-learning or skill-loving) as applied to creative writing (versus the information-educational) is studied as a possible solution to the problem. The method consists of the three parts of the creative process: theory, practice and output (being/theory – doing/praxis – making/poiesis/aesthesis). The theoretical framework is concretized by visualization, telling, and showing. According to the postmodernistic interpretations of Nietzsche we should view him as an anti-narrativistic philosopher and a keen promoter of the dissolution of the self. These views have achieved a dominant position in the field of Nietzsche research and they have more or less become the unquestioned dogmas of this field of study. I would like to step away from the postmodernistic tradition and approach Nietzsche's works from the vantage point of the narrative human sciences. I've read Nietzsche in relation to some of the central ideas of narrative psychology, narrative social psychology and narrative social science and I've come across some striking similarities. Nietzsche seems to have anticipated many of the ideas that have developed in the field of the narrative human sciences since the 1980's. The connection is especially clear when it comes to Nietzsche's views on interpreting the past, projecting the future or coping with unfortunate events. I wish to show that Nietzsche understood the human condition very much in the same way as the narrative psychologists and the narrative social psychologists of today see it. Nietzsche seems to have understood very well that the meaning of past events depends on the narrative that binds them together. He also realized that by giving oneself goals and aims one can render his/her life meaningful. There is also strong evidence for the claim that Nietzsche saw the identity of a person as a narrative construction. All these ideas are closely related to the narrativistic outlook on human experience. Therefore, I believe that a dialogue between these two discourses might prove fruitful. Nietzsche’s philosophical autobiography, Ecce Homo, could also be characterized as literature. It deserves a special position not only in philosophy, but in the Western literary tradition of self-narratives. It ought to be considered a unique textual self-study, of which narratological analysis serves a special lesson. It has to be analysed as the culmination of such a process, that in the course of it, following a consistently completed rhetorical, narratological and cultic strategy, Nietzsche took deliberate steps towards a narrative restructuring of his oeuvre for a „posthumous” readership. How did this restructuring process take place and what are the present results of this total recontextualization? It can be most vividly highlighted by using the instruments of contemporary narratology and literary parallels like Aristotle, Saint Augustine, Montaigne, Musil, Borges, Nabokov, Salinger and others. Irodalmi mulatság "a nietzschei narratívák után"
NIETZSCHE’S CRISIS: DEBT, GLOBALIZATION, AND "GREAT EVENTS"
A szervezők köszönetet mondanak Prof. Heikki Hankának, Tuuli Lähdesmäkinek, Jaana Janhila-Anttonennek, Klapcsik Sándornak, Risto Niemi-Pynttärinek, Juha Teppo-nak, Katri Kluukerinek (Jyväskyläi Egyetem) és Vály Sándor képzőművésznek (Helsinki) az események előkészítésében nyújtott segítségükért. A Dionüszoszi Labirintus támogatója a Moyva Imageneering LTD.